On the afternoon of Monday, June 20, a group of pastors, retired ministers, missionaries, Anderson University professors, and laypeople packed into a makeshift theater to watch a multimedia presentation of the early days of the Church of God in Anderson. They were reminded that since 1907, the Church of God has had a longstanding relationship with the city of Anderson. After a couple incredible conventions in Oklahoma City, and a historic gathering in Vancouver earlier this year, Church of God people are returning to a city with over a century of rich camp meeting history. 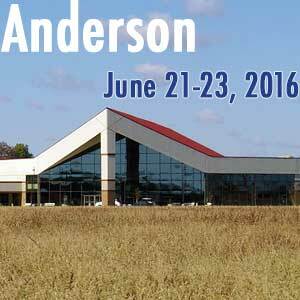 More rich history will be made again this week as Church of God people once again reconvene in Anderson, Indiana. Convention-goers who arrived early on Monday took part in meetings of the Church of God Historical Society. A new video bringing to life the early days of the Church of God in Anderson was premiered, and the Historical Society is excited to offer more information in the months to come. CHOGnews will keep the Church of God informed on these exciting developments. Leading up to the kickoff service at 7:00 PM, multiple meetings of boards and ministries have met and continue to meet. From 2:00 until 4:00 this afternoon, East Side Church of God will host two meet-and-greet events: one, for the nearly forty international missionaries in town; and two, for the newly announced president of Warner University and his wife, Dr. David Hoag and Joanna. No RSVP necessary. Back at Madison Park Church of God, the Regional Convention officially kicks off at 7:00 PM. Alanna Story, known for excellence in leading worship at events across the movement, will pour heart and soul into tunes that give honor and glory to God alone. Milton Grannum will deliver a compelling message designed to both encourage and challenge who we are as the Church of God. Global Strategy, the international missions-sending arm of the movement, will commission Alejandro and Carmen De Francisco as missionaries to Spain. A Spirit-filled evening is in store, capped off by a reception honoring the more than thirty years of missionary service given by John and Jodie Ackerman. Wednesday promises a great lineup of speakers, including Ben Hardman, Arnetta McNeese Bailey, Steve Arterburn, and Reggie McNeal. Hundreds of convention-goers will remain in Anderson on Thursday for the second of three CHOG Tables this year, altogether focused on the timely subject of immigration and how the church should respond to the refugee crisis. You can still purchase Regional Convention single-session (evening sessions only) tickets at-the-door for just $15. Don’t forget to use the official convention hashtag—#Reclaim2016—for convention-related posts and pictures on Twitter, Facebook, and Instagram! Welcome back to Anderson, Church of God! This entry was posted in All Church of God, Church of God Convention and tagged Anderson, camp meeting, Campmeeting, convention, De Francisco, Indiana, Madison Park Church of God, Reclaim 2016, reclaim your neighborhood, regional. Bookmark the permalink.